Does chlorinated tap water affect the fibre reactive dye process? I’m currently doing a lot of Fibre reactive dyeing, and trying to improve my results by fine tuning all the variables. hexametaphosphate keeps calcium and magnesium dissolved so they will not interfere with the dyeing process. I’ve looked everywhere for this info, not having any luck. Does chlorinated tap water have any appreciable effect on the fibre reactive dye process? Our water at home is very good well water, but at my studio it’s pretty stinky, yellowish, chlorine filled stuff. I have a lot of reading to do by the looks of your very informative site! I’m some glad to have found it, and your wealth of knowledge. Water quality does make a difference. Chlorine’s not the only contaminant involved, if your water is stinky and yellowish. Some contaminants are much more important than others. Chlorine for disinfecting water supplies can be added as chlorine gas or as hypochlorite (which we call household bleach), or the chlorine compound chloramine can be added instead. Chloramine is more difficult to remove. Chlorine can be removed with hydrogen peroxide, or by evaporation, but chloramine cannot. Both chlorine and chloramine can be removed with Anti-chlor (sodium metabisulfite), which is readily available from dye suppliers, as well as from sellers of supplies for home beer-making and for photography. The same chemicals used for neutralizing chlorinated water are also used for neutralizing chlorine bleach used as a discharge agent; see How can I neutralize the damaging effects of chlorine bleach?. When my area’s public water supply changed from chlorine to chloramine, we began to notice more fading of clothing, even clothing dyed with good Procion dyes. The colors still last a long time, but a garment that has been washed a hundred times is noticeably paler in color than when it was new. It would help if we were to always add anti-chlor to every washload, but, since our problem is not very severe, we haven’t felt it to be worth the bother. Dyers often need to be aware of hard water, which is water that contains calcium and/or magnesium ions. (See Dyeing with hard water: water softeners, distilled water, and spring water). These ions are what combine with soap to make soap scum, which has to be scrubbed off of surfaces. Hard water has more than one consequence in dyeing. 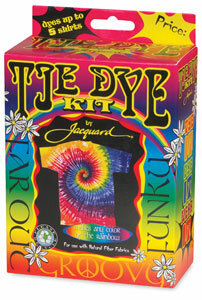 It can result in colors that are not as bright, it can make it seem as though your soda ash is not dissolving completely even when it is (because of the formation of insoluble calcium carbonate), and it can result in the formation of dye/calcium complexes that are more difficult to wash out of the fabric, resulting in later color bleeding that makes it seem that the dyes are not washfast, when in fact it is only incompletely-washed-out unbound dye. The solution for hard water is easy. Buy sodium hexametaphosphate, also known as water softener. 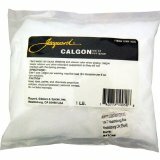 Sometimes sodium hexametaphosphate is sold under the name of Calgon (Jacquard Products still uses the Calgon name on their water softener for dyeing), but beware of other products also sold under the Calgon name, which contain carboxylates rather than phosphates; carboxylates which are not desirable for dyeing. Do not buy any liquid form of Calgon, since these generally contain carboxylates rather than phosphates. Mix sodium hexametaphosphate in the water you use to dissolve your dyes, and in the water you use in your dyebaths; also add it to your wash and rinse water, when washing out excess unattached dye after dyeing. The amount needed varies according to the hardness of your water supply; I can tell you more about this if needed. Neither chlorine nor hardness will make water yellow. If your water is yellowish in color, it has additional contaminants, which can be a big problem. I’m concerned that you may also have iron. Iron is one of the worst water contaminants for dyeing, though it is safe to consume in the quantities likely to be present. Iron tends to “sadden” many dye colors. It’s used as a mordant with natural dyes to produce dark, dull colors, but it can also affect the colors of synthetic dyes. If your water is contaminated with iron, you probably won’t want to use it for dyeing bright colors. You cannot remove iron with phosphates or with anti-chlor. Water softening systems work well for removing hardness minerals from water, but they do not generally remove large amounts of iron. Specialized water purification systems that can remove iron are more expensive than ordinary water softening systems. A reverse osmosis system would work. You can use distilled or deionized water. Otherwise you may be reduced to bringing water to your studio from home. To see how severe your problem is in practice, you should do some small scale tests of dyes you like, using only distilled water in one set, while using the stinky yellowish tap water available at your studio in a second set. Perhaps in a third set you could use tap water that you have treated with anti-chlor and hexametaphosphate. I would be interested in knowing how significant the difference turns out to be for you. This entry was posted in chemistry of dyeing, water softener on April 1, 2015 by pburch.